Butterfly Reflections, Ink. : Have a Merry Christmas Deer! Have a Merry Christmas Deer! Hi everyone, Jenny here. I hope you're all having a wonderful Thanksgiving for those of you that celebrate it. I'm certainly looking forward to stuffing my face with Turkey later!! This week I have not one but two cards, using the most wonderful christmas/wintery/fall type background stamp I think that ever existed (note: opinions are my own and in no way reflect the views or opinions of Butterfly Reflections Ink ☺☺☺☺). It's the Hero Arts Forest and Deer Background stamp. This was released I think early this year, but honestly it's so versatile and impactful, you just gotta get it! 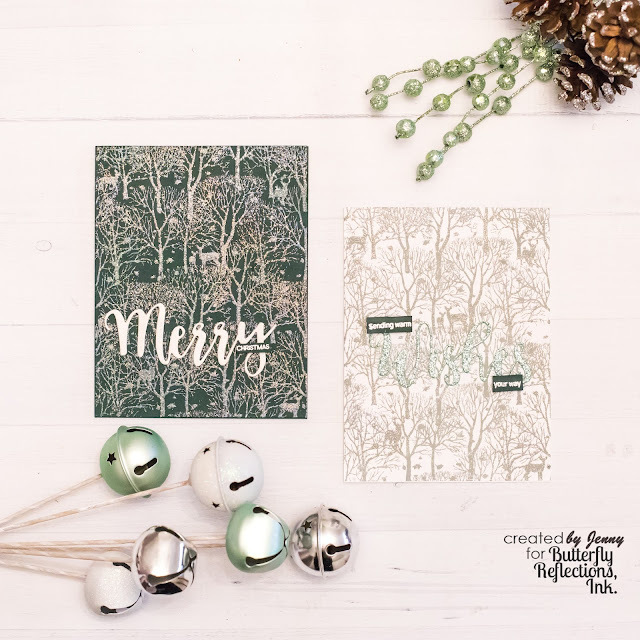 To create the cards I used Distress Oxide Ink in Iced Spruce. I used Oxide for two reasons - one, I'm stamping on dark green cardstock and the Oxides act more like pigment ink (they're opaque) and show up really well on dark cardstock. And 2) they stay sticky long enough to heat emboss without adding any additional embossing ink. I inked up the background stamp and stamped twice using my MISTI for each card, on both white cardstock and dark green cardstock. I then sprinkled sparkly clear WOW! embossing powder over the top and heat embossed. I then adhered the panels direct to a matching card base. The sentiments are by Altenew using the Holiday Script Words dies cut from glitter cardstock (on the green card I used white glitter cardstock). 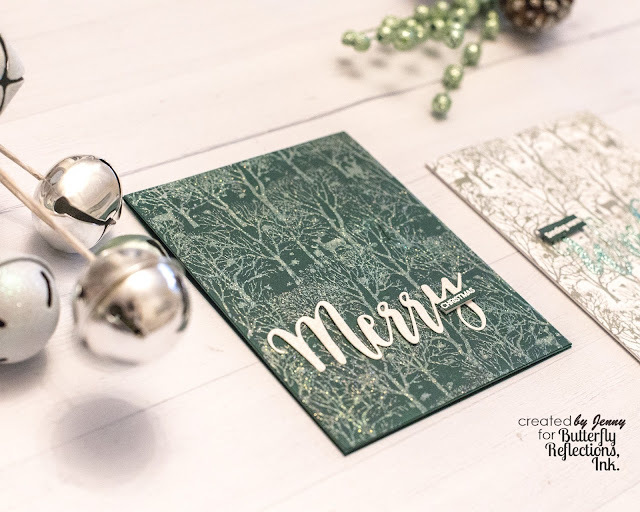 I stamped the sentiments in Versamark onto a scrap of leftover dark green cardstock using Versamark and heat embossed with Hero Arts white embossing powder, trimmed and popped up on foam tape. 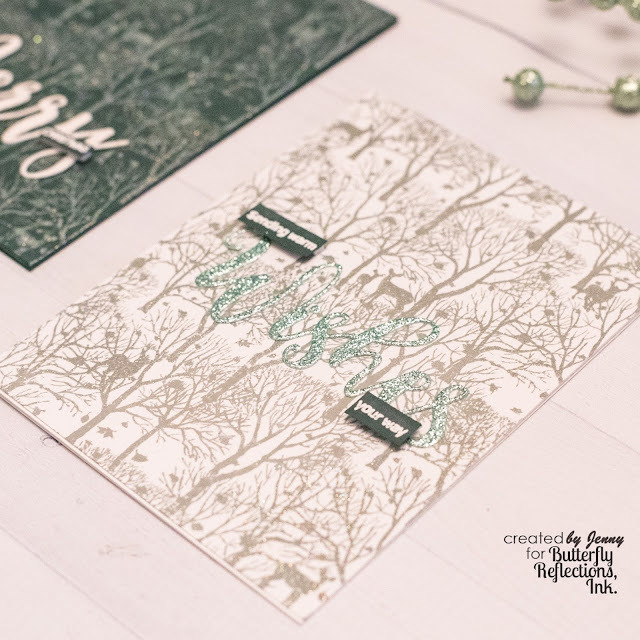 The sentiments are from this fantastic Happy Holidays set by Altenew. I think you could totally change the sentiments on these cards to make them less christmassy and more wintery/fall themed. I just love this background stamp so much! !